Another giveaway for mom, but this time it's sentimental. Something you'll hold close to your heart. It's a special way to commemorate the birth of your most prized possession. Today JULIAN & Co. is giving away a constant reminder, one that is always with you, something close to you even when your little one isn't. You'll fall in love with the simple and timeless sterling silver pendant inscribed with your child's name on the front and their personalized birth information on the back. It's the highest in quality and will quickly become a timeless heirloom. JULIAN & Co. also specializes in the entire family. You'll find birth necklaces for dad as well as key chains and cufflinks, bracelets for babies and kids, nursing necklaces, godmother necklaces and so much more. Each piece is customized to your liking and is heirloom quality. What is your favorite JULIAN & Co. piece? *winner will be announced Monday January 19th along with winners for each giveaway in the giveaway-a-day sequence. I would have to say my favorite piece is the Mini JULIAN & Co. It is hard to pick only one...all of their designs are beautiful! I absolutely LOVE their stuff. My favorite is the NICU necklace. My daughter was a preemie and I've been giving this as a gift suggestion to my husband for a couple months. I'd love to win. The Heart on Her Wrist bracelet is the loveliest thing I've seen in a long time. What a great giveaway. i really do adore the del mar birth rectangle. so timeless! thank you! If I had to pick just one, I'd go with the Galleria necklace. Beautiful. I would love to win this birth necklace for a dear friend who just had a son! I like the small galleria necklace. All of their items are beautiful though! I ove the ID bracelet for my daughter, who is obsessed with mine! I love how simple and classic these pieces are!! all so nice ... but what you have chosen is lovely. the birth rectangle necklace. Um, I really can't choose. There are so many beautiful pieces! I'd seriously have to browse for hours...which is what I'm going to do today! All are so lovely! I am kind of a simple gald so the small galleria necklace would be perfect. I like the nursing necklace. I used to wear a piece of string with a toy wrapped around it for while he was nursing. I think the tags in the giveaway are super nice too. I think my boyfriend would LOVE it. I love their stuff, it's so simple and perfect. their pieces are so delicate and sentimental. i like the small galleria necklace best. Del Mar 6, love it. Oh, I want to win this so bad. I have a little two month old and I was hoping my dh would get me a special piece of jewelry to commemorate his birth. The small round birth necklace would be perfect. Our first little guy was a preemie, so I'd love to win this and have dh add the preemie charm so I can have both my little guys around my neck. that birth necklace is so special...great idea! I would choose the del mar 10. Simple---I love it. This stuff is so pretty. I really like the del mar. I love the round Birth Necklace and the Nursing Necklace. Lovely pieces. I love the Small JULIAN & Co. Galleria Necklace, very pretty! Thanks for the chance! the small galleria necklace is lovely. I love the small galleria necklace. With five kids, it's hard to find things that can fit all five names (luckily they are short names). I really like these. I like The Nursing Necklace the best. All of them are amazing but I really love the square birth necklace. So adorable! I love the Del Mar #10! What sentimental, understated pieces. I'd probably have to go with the Del Mar Birth-round. I've seen this jewelry before, beautiful. My favorite piece, the Mini JULIAN & Co., with two charms, one for my daughter, born in April 2005 and another for the tiny baby boy we lost last year. I would love to wear both their footprints close to my heart. I hope one day to be able to add another charm to the necklace. I love the Del Mar necklace in the giveaway. I love the nursing necklace too. I love the round discs in Gold. So pretty. Love the Nursing Necklace...anything to help my baby girl stay on is a plus! I have suggested to my husband that anything in their line will be a perfect Mother Day gift! I love the birth bracelet...so classy! The DEL MAR 6 in gold is gorgeous!! All of these pieces would be so precious to have FOREVER!! Truly timeless-thanks! I was JUST thinking about something like this last night, hoping my husband would get me a "push present." :) I love the Nursing Necklace. I think I'd have to go with the Del Mar birth square. SO beautiful and understated. LOVE IT. My favorite at Julian & Co. has always been the small Galleria necklace. Thanks for the giveaway! It's a toss up btwn the mini Julian & Co and the rectangle necklace. Love their designs! Would love anything from Julian and Co. I love the nursing neckless! The Godmother necklace is very sweet, but it's hard to choose - they have some nice designs. These are absolutely beautiful! The Del Mar round pendants for mom and the galleria necklace are tops on my list. So simple and gorgeous! I love the birth rectangle necklace you show here. I am due in April and would love one of these as a little reward! i love the rectangles, and the little circles. i think i would mix the shapes as i have more children! I love love the baby ID bracelets. I love the Del Mar Birth Circle. Their designs are beautiful! The Nursing Necklace has my vote. Love the birth rectangle As well as the baby bracelets. It is all beautiful. OH, soooo cute! I love the little I.D. bracelets. Great product! I really like the small galleria necklace, but think they are all beautiful! I like the baby disc ID bracelet, with footprints. There is just something about baby feet! I love the galleria necklace because I could put all my kids names on it. I love the birth bracelet - I would always wear it. -Kristin R.
Hello, I love julian and co. jewelry! The Del Mar Birth is my favorite. Very classy stuff! I love the Birth Rectangle. Perfect way to remember a little one who isn't with me any longer. I love the Julian & Co Galleria necklace. What a unique and adorable way of showing off your pride for your little ones. I think I would have to choose the del mar birth rectangle necklace. I like the "Nursing Necklace" a lot, but I would have to test it first to see if it could really hold up! I really like the Heart on her Write bracelet...They have some many great choices, I would be happy with anything from their store! I also like...the Julian & Co. Mom...and most of the lockets!! Great giveaways! I'm really loving the small galleria right now, but the square del mar is awesome too. Such cute things - would love to win one. Thanks! I love their stuff... especially the mini julian & co. I was just looking at their necklaces the other day thinking how beautiful they are. I would have to pick the Mini JULIAN & Co. and get one for my daughter and soon to arrive son. I would definitely pick the one of the galleria necklaces - so simple and classic. I am loving the birth stone pendant!! Del mar birth rectangle is my favorite. Would be perfect for my april baby girl to come. I am loving the Del Mar 6. The smallish circle. Pretty simple, but so cute. other than the rectangle pendant, ithink i like the birth key chain for dad the best. My fav piece is the JULIAN & Co. Galleria Necklace - Small. Gorgeous and feminine! My favorite is the large birth necklace for dad. My little girl and her daddy have such a unique relationship and this would be a really special gift! I love the Galleria! love there designs. Please bless it is me. i've always wanted one of these. SO cute! Jan 19th is my birthday and I love the birth bracelet and the nursing necklace! Lovely! I especially like the DEL MAR 7S style. Thanks! I love the JULIAN Key Chain. my favorite is the gold del mar 6 i also like the keychain its all great! The Del Mar Birth necklace is really my fav but all their stuff looks wonderful. all so cute but i love the del mar birth pendants. The nursing necklace. It would be nice for baby to have something to hold onto besides my hair. the nursing necklace is so pretty! I love this company. The small galleria necklace is my favorite for me, but I've been thinking about the cufflinks for my hubby. I love the ID bracelet for kids. My kiddo would look styling in that! I really like the Godmother necklace. Their jewelry is soo pretty! Thanks for the giveaways! I like the nursing necklace washer. Very cool. I like the birth bracelet- I have been wanting one of these for awhile-thanks! I love the "Heart on her wrist" for a baby! So dang cute....this is such a great idea! the del mar 10 is simply lovely. maybe for my twin sis who is having a baby girl in february! Please pick me. I have wanted a birth necklace since I first saw them. I love everything. I especially love the Del Mar Round. What great stuff. DEL MAR Birth - Rectangle. Cute, cute, cute! I love the cuff links. 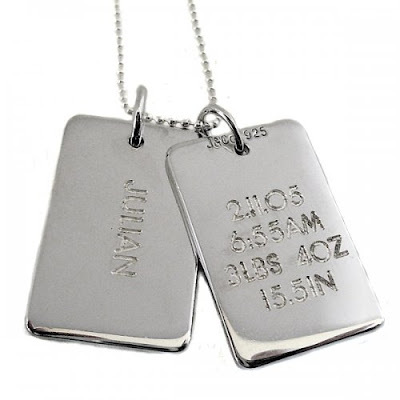 There's something beautiful about the thought of a man wearing them to a big meeting or formal event and having his son/daughter's info on them! I love the Mini JULIANO & Co. So sweet and beautiful! My favorite is the small Galleria piece!What a great idea! i love their delmar 6 necklace for mom... one for each child! i love their stuff, and i don't even like jewelry! I have been wanting the Julian & Co Galleria necklace forever! I love the del mar collection. I can;t decide between the round and the square. I love the birthstone option. I would love to have all my kids birthstones on a necklace. And I love the rectangles where you have the kids info---wouldn't that be great at the Dr.'s office! Those birth necklaces are beautiful! I love the large square design. I LOVE the Birth Necklace in square! So adorable and a perfect way to remember my babies when I'm away. mini julian and co. in gold. i love gold. i love small. i love my kiddettes. I would love to get the birth keychain for my boyfriend... it would be a wonderful gift on his son's birthday! The Galleria small necklace would be a great "everyday" necklace! they're all beautiful, but i think the nursing necklace may be my favorite. sigh, i NEED to win. i've lost the F charm from my mother's necklace and now only have the A to represent my daughter. the rectangle birth necklace would be lovely, lovely. The Del Mar 7 necklace is gorgeous--and with an added birthstone charm? Stunning. I have never heard of this company. Thanks for the introduction. I love the birth bracelet. Kristin H.
This is my favorite giveaway of yours! I love everything, honestly. I like the birth bracelet. My favorite piece is the Galleria Necklace. Although, I love most everything there. All of their designs are so cute!!! I love the necklaces...now which one to pick?!?! Gotta say the del mar birth rectangle, amazing! Thanks! These are so neat! I like the nursing necklace or the Mini Julian & Co. I am loving the birth bracelet, but they are all so sweet! I really love the birth necklaces. They are beautiful! The footprints and handprints are the perfect touch! This is such cute stuff. I have wanted something with my bambino’s name. I like the Del Mar 8, simple and cute! But really, isn't it too hard to choose? I love this stuff! Thanks for sharing. So hard to pick my fave. I love the 1/2 circle necklace with name and date. So beautiful! The birth necklace is my fave .. what a beautiful piece. I love all the things Julian & Co has, but I must say the Godmother necklace would be a wonderful thank you to my daughter's godmother!! I love the Gallery birth necklaces. I love so many of them...I'm thinking the square birth necklace Xs 2 for since I have two litte guys! What beautiful pieces they have! Love the small galleria necklace! I love the nursing necklace and the birth square! Beauties! I really like the galleria necklace! The Birth Bracelet is my favorite! I think this is a lovely company and I'd be happy to win anything with a ball chain- Love em'! My favorite is the birth keychain. I LOVE the Del Mar Birth Square, but they really are ALL fabulous. This would be great for a grandmother too. I think I would have to go with the Del Mar square. All of the pieces are beautiful...it would be hard to choose just one!! i like the mini julian in gold. so cute. My favorite is the Galleria necklace - timeless. i love the galleria ones for me! so classic! I love the Mini Julian&CO. It's so cute!! It helps you remember how small they once were! My favorite is the small round birth necklace. Love it. I hope I win! I like the mini julian & co as well as the birthing necklace. It's a hard choice (everything is so pretty!) but I would pick the Nursing Necklace. The Galleria necklace is my favorite, but all their stuff is so cool. Del Mar birth square is my fav. So beautiful, just like my little girl. I love the small Galleria Necklace! They are the most generous people ever. I lost a baby 2 months ago and because I did a post about how I thought someday I should have a necklace with my childrens name on it, she sent me one. I love their company. The mini julian is my favorite, if I won I would love to give one as a gift. I'd have a hard time choosing between the Del Mar Birth square and rectangle. What a fabulous idea! the del mar birth rectangle would be on my neck EVERY day! what a great necklace! I would love to give this as a gift to my daughter when she has her baby next month, so I'd have to say the birth necklace is the winner. It's a hard choice, but I think my favorite is the nursing necklace. I've been wanting one of these for my sister. I love the del mar rectangle--it's modern but still pretty. My favorites are the mini Julian and Co or the round birth pendant. Love them. My daughter died so this would be another great way to remember her. I would love a nursing necklace!